Zoolender approached LunaWebs, seeking a new and impactful way to connect users with bank owned properties i.e. homes, cars, and recreational vehicles. The project required implementation of professional design and functional features- generated by sound custom programming for potential expansion. Up to this point, no other website of this caliber has successfully filled this void in the marketplace. Zoolender wanted to position their website as a leader in this category online. 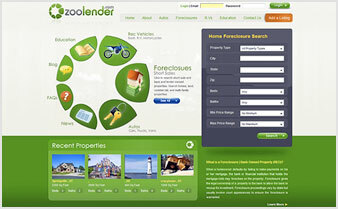 Luna Webs eagerly responded to partner with Zoolender in launching a new website: an online resource for bank owned properties. LunaWebs combined elements of social networking tools, advanced search and directory listings, member registration, flash design, and back end maintenance functionality. 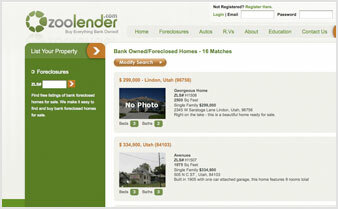 The site allows navigation through pages for educating users on foreclosures, RSS feeds from news sources, searchable property listings, blogs, and forums. Custom maintenance tools and reporting features allow the site administrator to update content within site regularly. It's just as beautiful on the outside in design and functionality, as it is on the inside (flash xhtml, css, php). Our custom design and programming integrated these varied elements into a powerful, robust website- designed with the user’s experience in mind. At this time, our SEO efforts continue to be implemented as we aggressively increase traffic and growth of Zoolender.com.